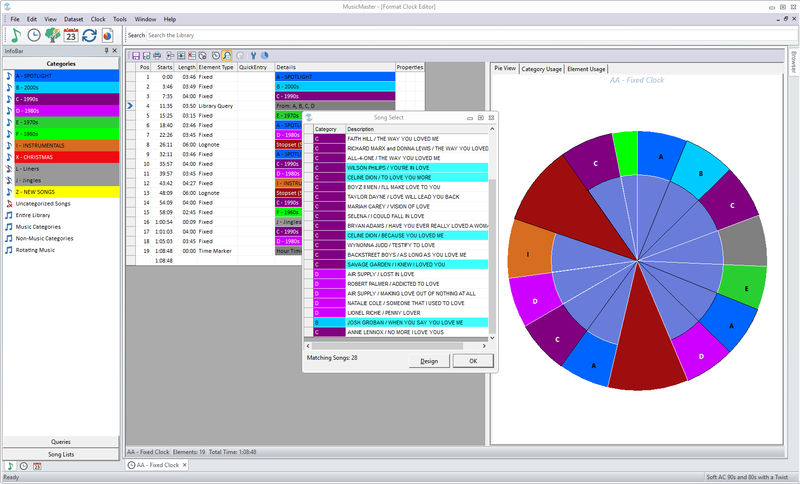 MusicMaster Pro Version 7 delivers entirely new customization options, including the ability for users to create new database fields at any time. New theme and style options and full Unicode Support are also available. In addition, Version 7 brings new functionality, including many new Format Clock editing tools, a Virtual Show Editor, an enhanced Broadcast Calendar, and more. Notably, Version 7 also introduces Virtual Search Depths, which automatically calculate and adjust search depths based upon how difficult it is to find a song, ultimately decreasing scheduling time. Take a look at a few sample screens below or click here to learn more about Version 7. Click images below to expand. Clock Matching Songs: Lookup the songs that any music element can potentially play, which also takes element filters into account. 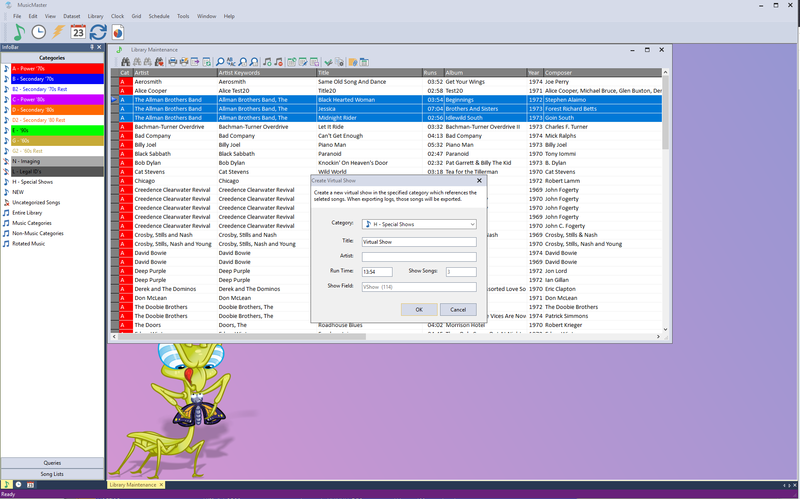 Virtual Show Editor: Build Virtual Shows by selecting a list of songs and adding them all to a single song card. 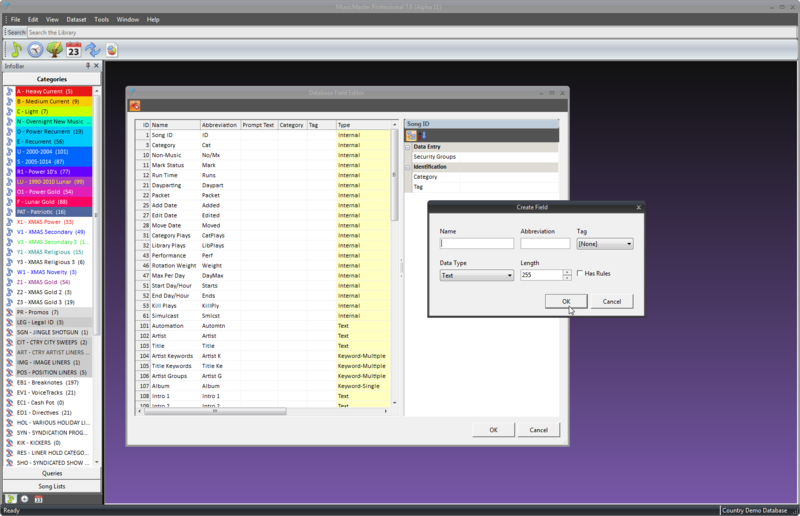 Create custom database fields for your library at any time. 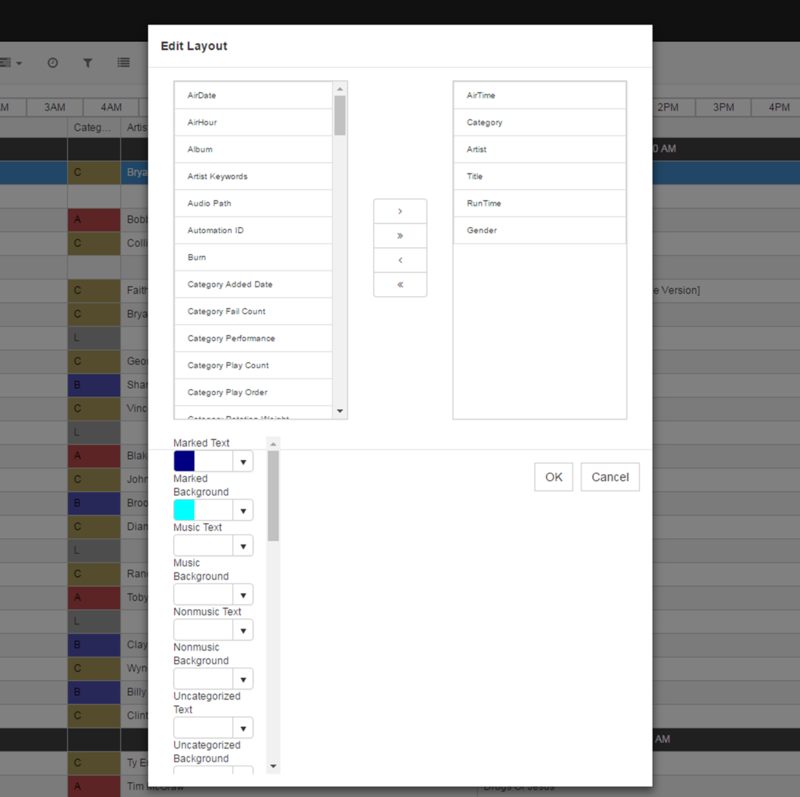 Category Color Wizard helps you come up with a good set of colors for your categories. The ability to have multiple instances of the Server running, with those servers synchronized for redundancy. More Automated Tasks, including exporting to Playout systems, log reconciliation, backing up databases and more. Continued improvements to the Import from Network feature providing more flexibility and simplifying the sharing of logs between stations. The ability to run Export to Automation, Reconciliation and other Import/Export operations from the Server, eliminating pathing issues from the Client. 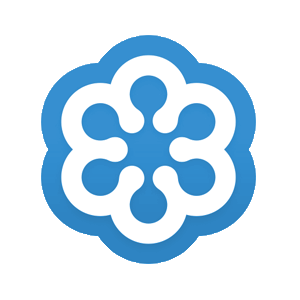 This is especially helpful for organizations with remote users. Optional Web Server with an all new MusicMaster CS Web Client that can be run on any operating system in a web browser. Take a look at a few sample screens below or click here to learn more about MusicMaster Client-Server. 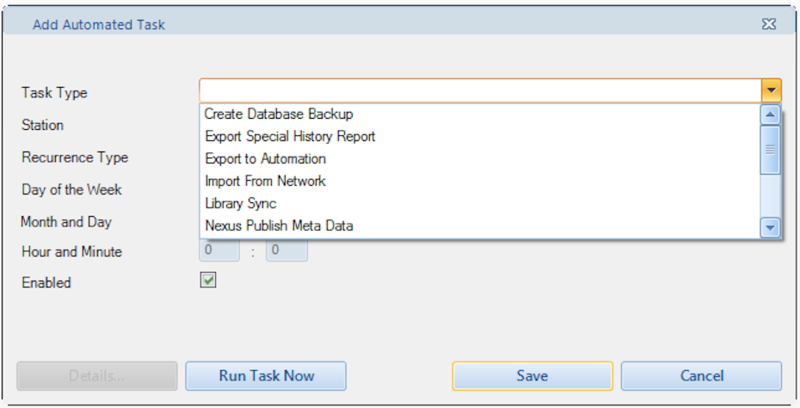 Automated Tasks are items a user can set up to perform a function at a specific time. We've added even more tasks to CS 2.0. 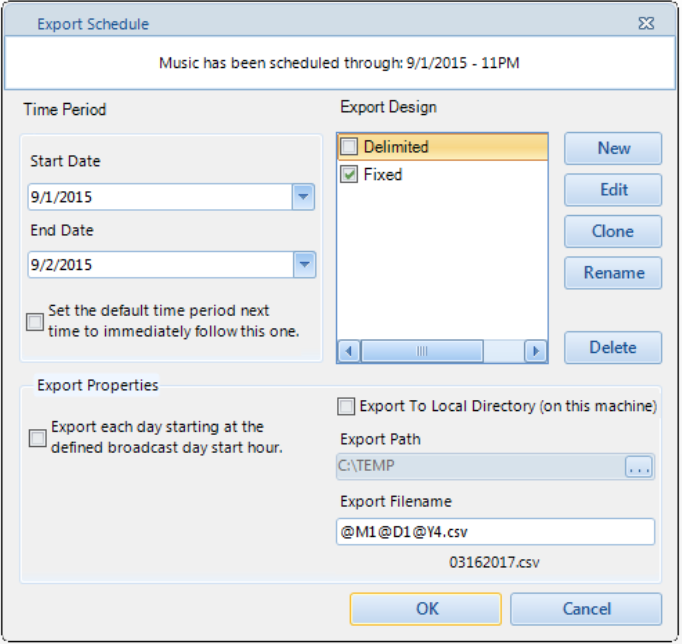 This option allows you to export the log to your third party system. 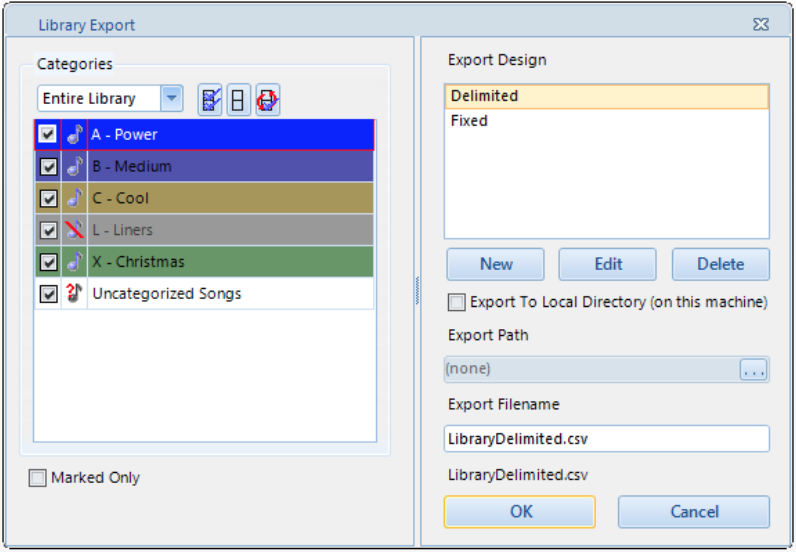 This also now includes the option to allow the Export to Local Directory override. 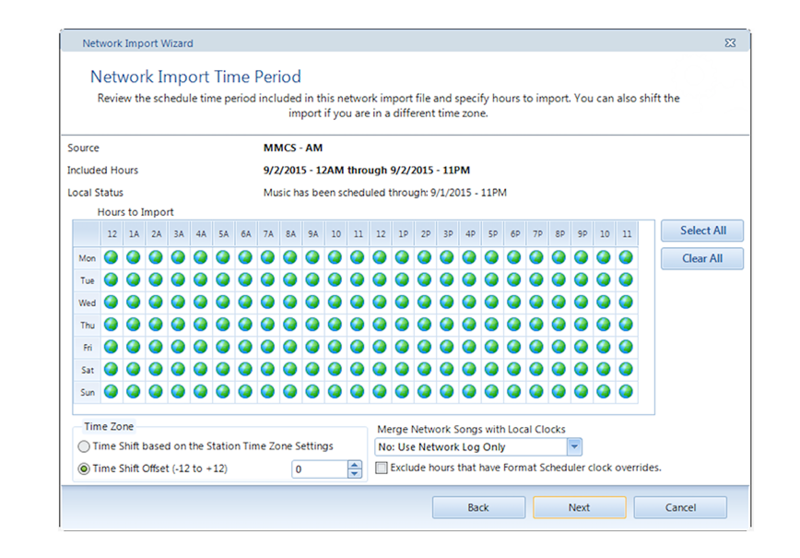 The Clock Importer allows you to import clocks and grids. 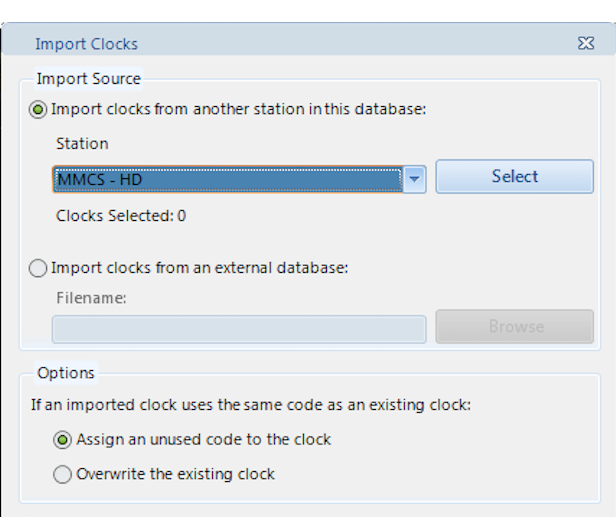 This shows how you can import clocks from another station. 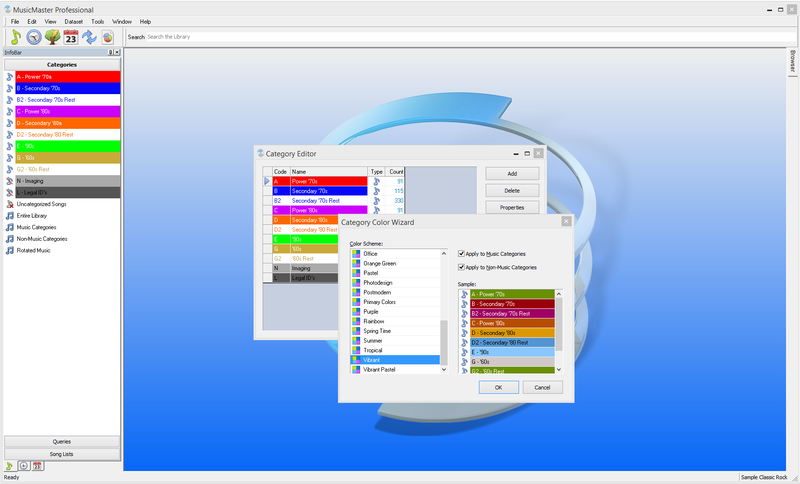 CS Version 2.0 now offers two options for user-interface: the original desktop application for Windows computers and a new web-based UI for use in any web browser. This new user experience delivers mobile access to the most commonly used software features. 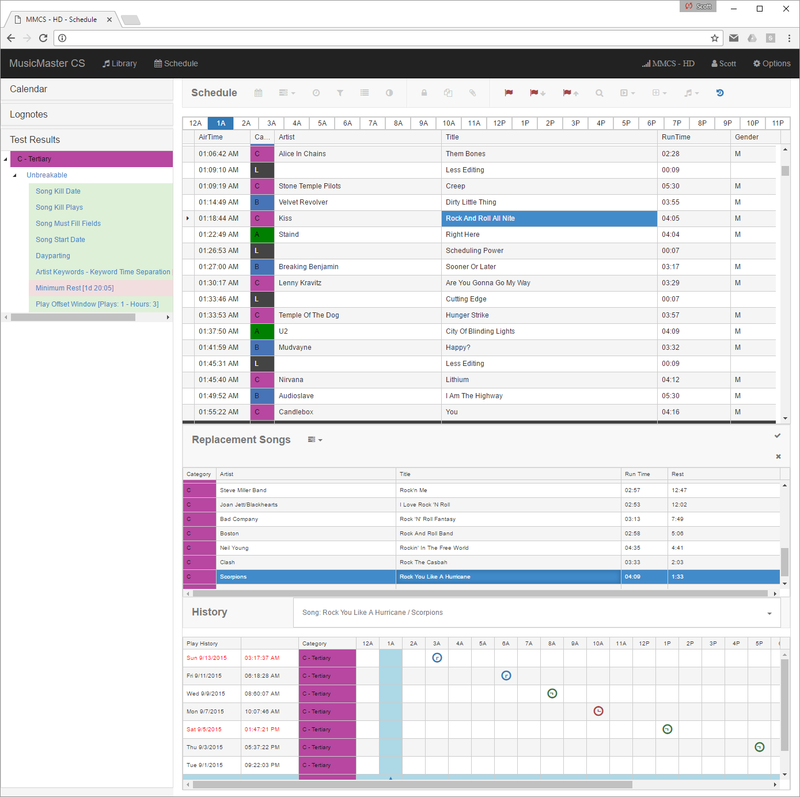 The first release of the Web Client allows users to schedule and edit logs and fully manage their libraries. Future updates will add the full functionality of the existing Windows client software. One of the main benefits of the Web Client is that it allows users to operate MusicMaster CS on any PC operating system or mobile device via a web browser, including Windows, MacOS, Linux, iOS, Android and more. Users can access data and the time and location that is most convenient to them, whether on-the-go or in the office. 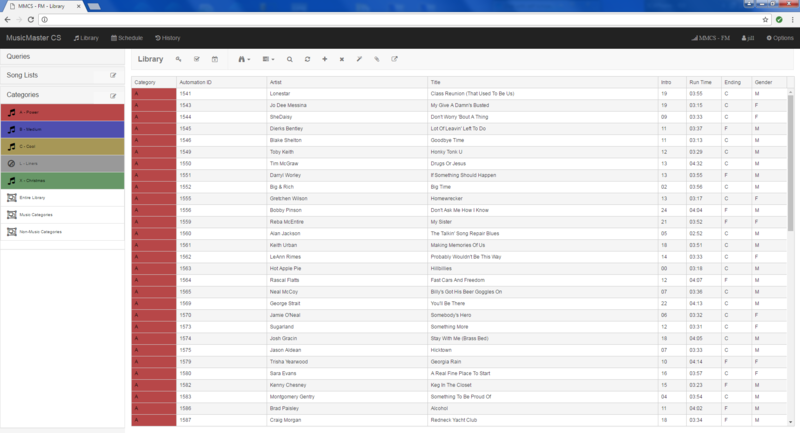 Library Maintenance: Add or update your songs, seach using Queries, change and save grid layouts, and more. Schedule Editor: When you want to change an element, you can use the Schedule Song icon as shown here. Save and edit your grids and layouts just like you do in the MusicMaster desktop application. 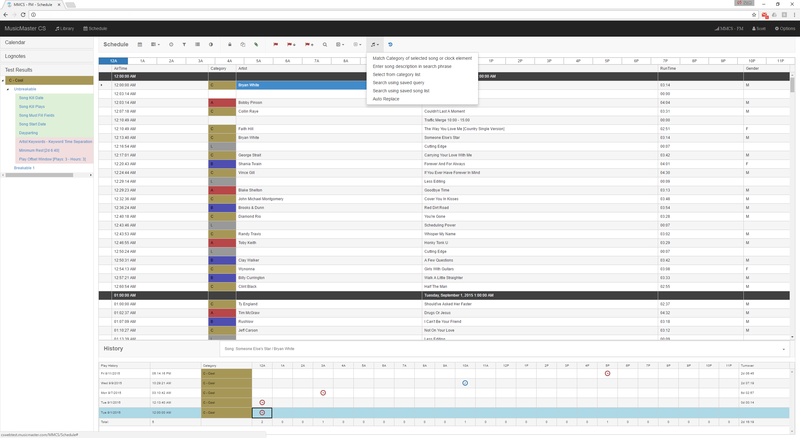 View your song history graphs in the schedule editor. The MusicMaster App uses the power of our Nexus Server to deliver a new mobile interface for MusicMaster Pro as well as CS. 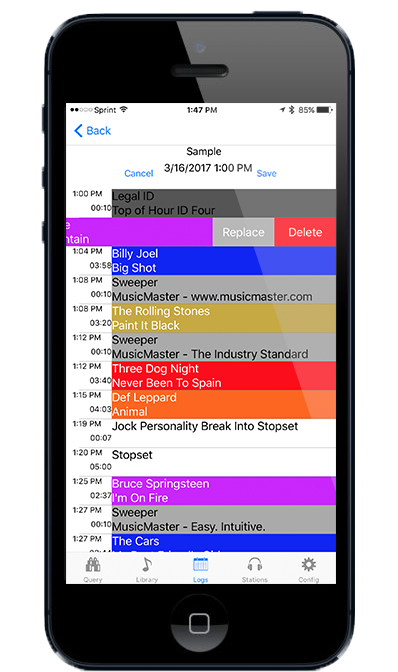 The MusicMaster App helps programmers stay even more current and in-touch with their audience by giving them the power to update their MusicMaster library or logs from anywhere and at any time using their mobile device. Library features include queries, search, and review of song card information and history graphs. Users can also open the log and be taken to the current date and hour, or change the date and time to edit any other log. They can even look for replacement songs by choosing to see the best testing songs, creating a query to search for something more specific, or simply moving an element to a new position. Replacing a song in the log using the iPhone app. 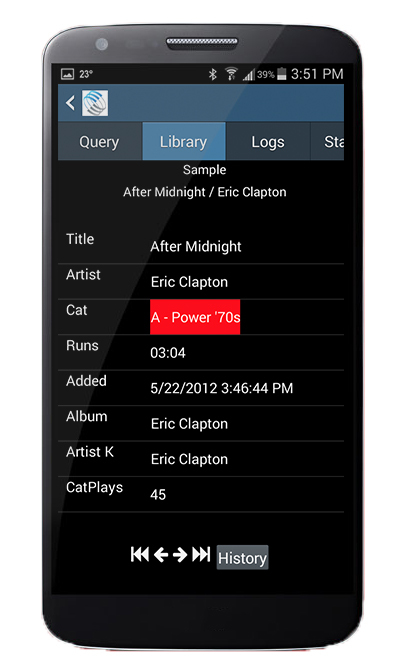 Viewing a song card in the Android app. 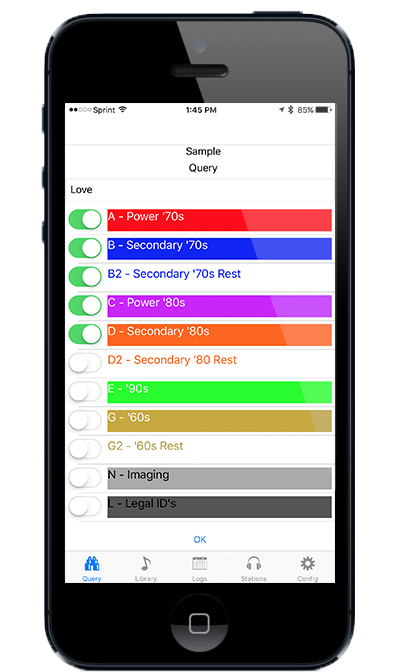 Querying the library in the iPhone app. Viewing the song history graph in the iPad app.